Members of various Tibetan NGO’s gathered in Dharamsala to condemn the involvement of Chinese authorities in the conducting of Kalachakra teachings by an unrecognised Panchen Lama, the highest ranking lama after the Dalai Lama in the Gelug school of Tibetan Buddhism. 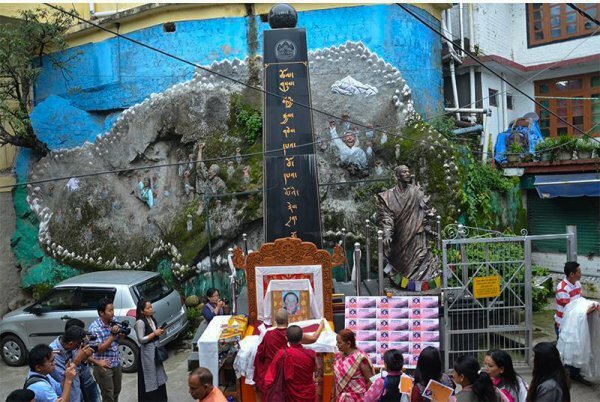 Four major NGO’s took to protesting in front of the Tibetan National Martyr’s memorial in what has been seen as a continuous interference of Chinese officials in Tibetan cultural affairs. 2016 marks the 21st year since the Panchen Lama's abduction by the Chinese forces. Even though the Tibetans have campaigned for his well-being in addition to his release, they have been let down. In spite of this shocking news broke out that starting from the 21st the Chinese State will hold a sacred and rare Tibetan Buddhist ritual A Kalachakra through a government-appointed Gyaincain Norbu. Not only this but Tibetans are being forced to participate in this ritual in attempts to force a religious congregation. Tenzin Tselha, the national director of 'Students for a free Tibet' told the Tibet Post International (TPI) that, "The Chinese government has abducted the 11th Panchen Lama and it has come to this point where the Chinese government has put their own installed Panchen Lama to do A Kalachakra. A kalachakra is one of the most important rituals." "But at the same time i say that another person whether the Chinese installed Panchen Lama is knowledgeable or not but at the same time we Tibetans inside and outside recognize Gedhun Choekyi Nyima who was abducted 21 years back as the Panchen Lama and he has the right to do this", she told TPI. In continuation she remarked, "one thing the Chinese government is doing is that they are not understanding the sentiments of Tibetan Buddhism or Buddhism in general and they are playing with it to hurt the sentiments or to gain power within the masses but religion or any kind of faith is not supposed to do that and we are outraged and we are deeply concerned about Gedhun Choekyi Nyima and his whereabouts." In the end she said that, "we are doing this event to tell the Chinese government that they don't understand the sentiments of Tibetan people and they cannot play with it and we are totally against it. "Another protestor told the TPI that, "The legitimate Panchen Lama Gedhun Choekyi Nyima has been missing since 1995 and with this symbolic A Kalachakra we hope to reaffirm his position in our community and keep him in mind." The A Kalachakra taking place in Lhasa today at the hands of Gyaincain Norbu is just another way that China has shown how they are badgering Tibetan religious freedom. The Tibetan people's faith and spirituality are being encumbered in addition to the inflicted deploration that Chinese authorities have caused by abducting the 11th Panchen Lama.